In the summer of 1844, in the Town of Kansas (later changed to Kansas City), the Rev. James Porter preached to about 15 people. After the sermon he asked all who desired to form a class to come forward. Six people gave their names and took seats on a log. With the preacher these six people were the beginning of Methodism in Kansas City. Services were held in a log school house and later in a frame school house near the river. In 1852 the congregation built a church at Fifth and Wyandotte Streets. It was the first Protestant building used only as a church in Kansas City. The church’s bell was the fire alarm for the town. During the Civil War (Battle of Westport) it served as a military hospital. In 1875 the congregation began building a much larger church between Eighth and Ninth Streets on Walnut. In 1884 a new brick building was dedicated at Ninth and Lydia. In 1907 a much larger church was built at Eleventh and Paseo. This facility had the largest auditorium in Kansas City with a seating capacity of 2200 people. The building was seriously damaged by fire in 1927. By this time the congregation was in decline as many of its members were moving farther south to the suburbs. In 1933 the church merged with the Kenwood church at Fifty-ninth and Kenwood Avenue. By 1938 the church had outgrown this facility and began looking for a new location. On October 16, 1938 a ground breaking ceremony was held for Central’s new church building located at 5144 Oak. The first service in the sanctuary was held on November 12, 1939. The church was formally dedicated on November 18, 1945. The sanctuary was destroyed by fire on July 29, 1965 and rebuilt in its present form in 1966. Remember, you can enlarge any image simply by clicking on it. On July 29, 1965 a fire ravaged the interior of the church sanctuary, damaging the original stained glass windows beyond repair. Each of the windows was a memorial window. The new windows, which were installed in 1966, continue to be in memory of the same persons. 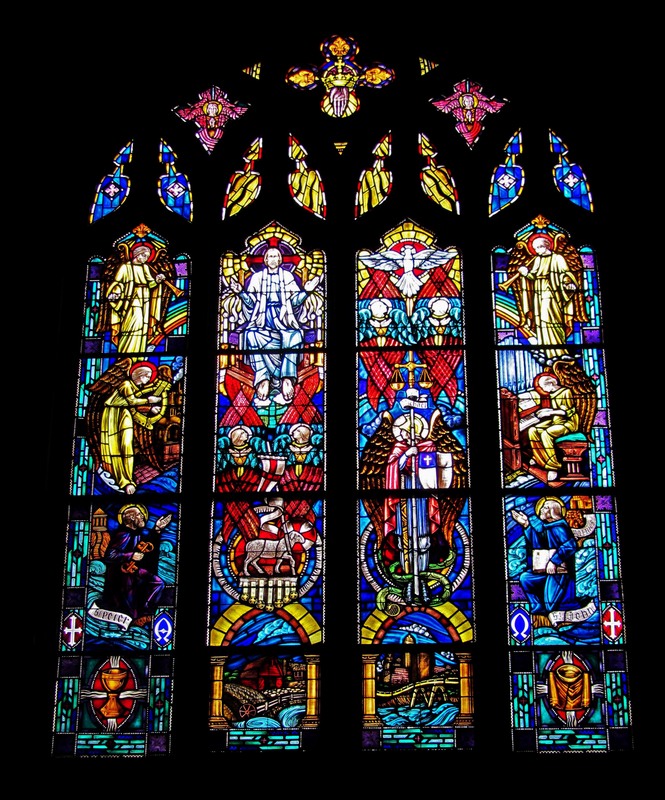 All of the new (replacement) windows in the sanctuary were designed and fabricated by Hopcroft Art and Stained Glass Company of Kansas City and installed in 1966. The Burrows Chapel in the church’s new west wing was dedicated in 1974. 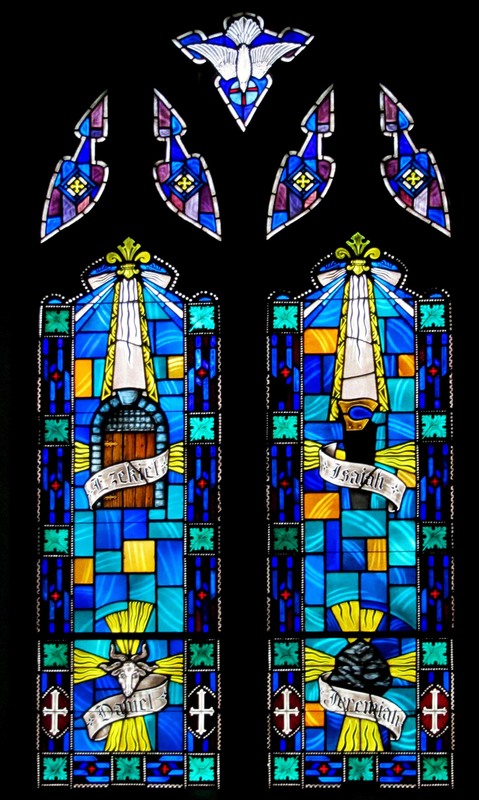 The six windows in this chapel were designed by Ronald Dixon and fabricated by Willet Windows in 1974. 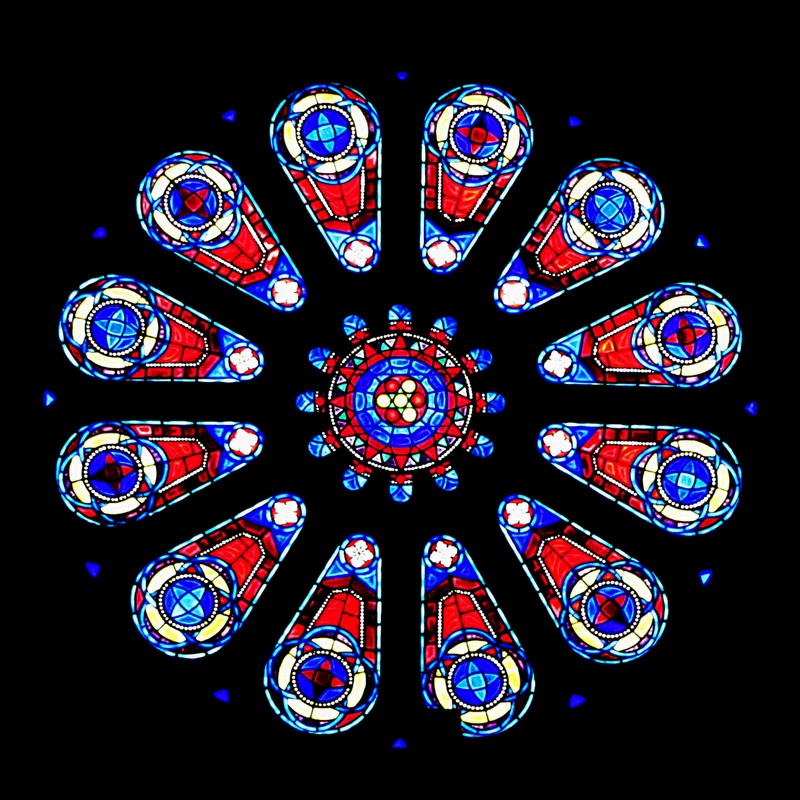 Above the altar at the north end of the sanctuary, the rose window is comprised of jeweled petals of Chartres blue, deep crimson, purple and gold. Since earliest times, color has had great liturgical significance: blue, symbolizing truth and fidelity; crimson, martyrdom and zealous missionary purpose; purple, both royalty and suffering; and gold; the majesty and glory of God. Memorial to Dr. Paul H. Linn, pastor of Central Church (1905-1909), president of Central Methodist College (1909-1924). Starting with the first window away from the altar at the west end of the transept, Old Testament stories and themes are depicted in the windows on the west wall of the sanctuary which are complemented on the east wall by stories and themes from the New Testament. Finally the great balcony window glorifies the living Christ as envisioned by St. John on the lonely island of Patmos. Thus the entire program of the windows in the sanctuary encompasses the whole sweep of Biblical history. The central panel shows God’s guiding hand forming the heavens and the earth, the land and the sea. Below, is the Angel of the Lord with his protective sword as he blesses the humbly kneeling Adam and Eve. In the right panel are the deeply changed Adam and Eve, whose disobedience to God’s law has brought about their expulsion from the Garden of Eden. We see the avenging angel with the flaming sword, the serpent, and Adam and Eve cowering in torment. They are now clothed with animal skins and Adam bears a spade indicating that life henceforth will be one of toil as they are banished from the Garden. The left panel of the Creation window depicts God’s covenant with Noah. Here Noah receives a scroll with directions for building the ark from a heavenly messenger. Centered above is the all-seeing eye of God, the points of the compass (NESW), doves and two triangles symbolizing the Triune God, one pointing to the Father, the other toward humanity. Across the lower section we see the grace and movement of the animals to be named by Adam and over which he is to have dominion. Finally in the lower center panel a lion and lamb lie in peace together. Here, as in each window of the sanctuary, one finds a border with stylized fleur de lis which are emblems of purity. The Creation Window is a memorial to John Matthews, Charles Hawkins and Judge William Holmes. 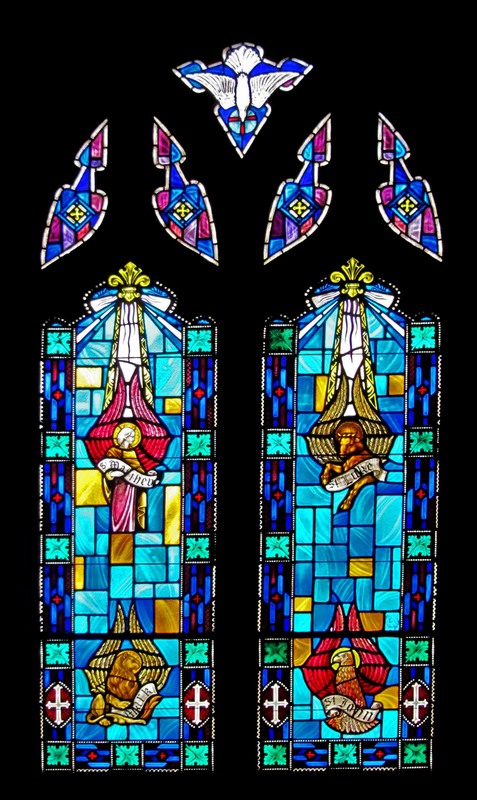 The next two windows on the west comprise the Moses story. In the panel on the right are the burning bush and the tablets given to Moses at Sinai. 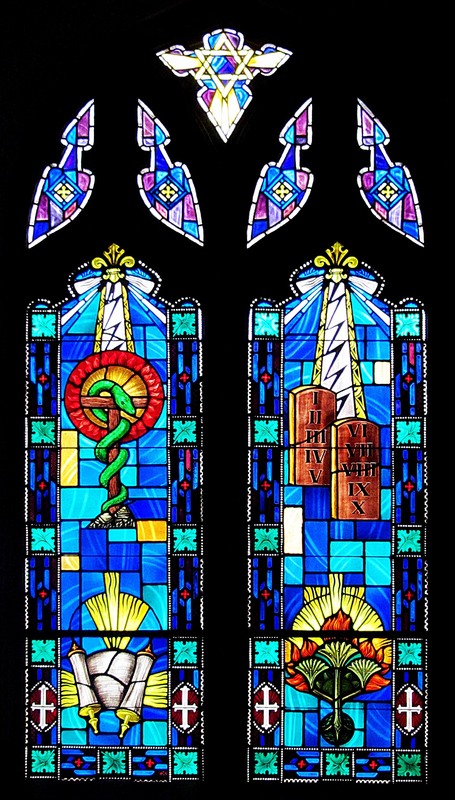 The upper section of the left panel depicts the fiery serpent and tau cross of healing. Below that, the beginnings of formally organized religion are suggested in the parchment scroll. At the top of the window is the six-pointed star of David. 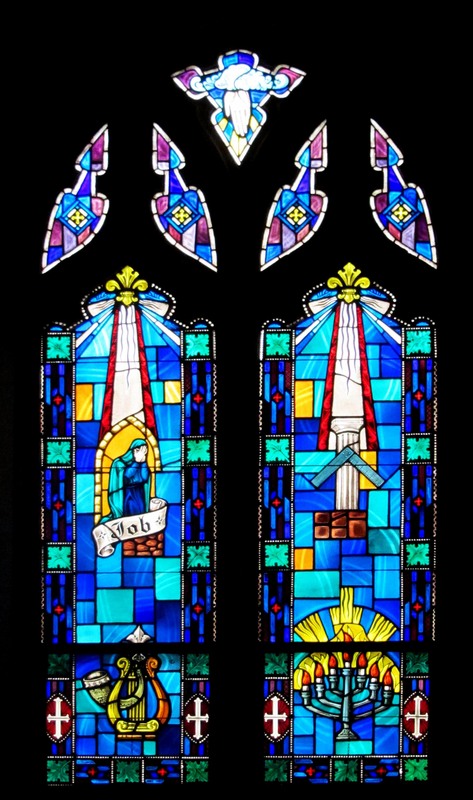 This Moses Window is a memorial to Elizabeth and Sim Beam. The Tribes of Israel Window is a memorial to Frank Burton. This window is dedicated to four major prophets of the Old Testament. Isaiah is symbolized by the saw, Jeremiah by a stone, Ezekiel by a closed tabernacle door, and Daniel by a four-horned ram. Above is the descending Dove of the Holy Spirit, affirming the reality of God’s presence. 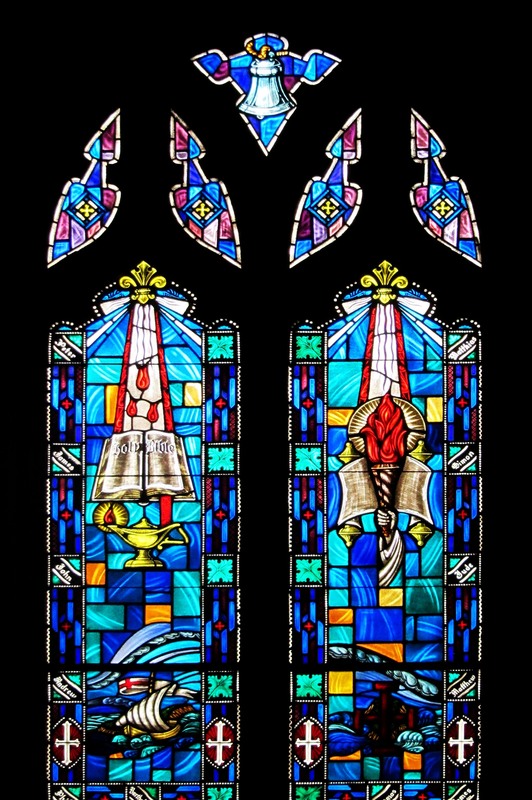 The Prophets Window is a memorial to Emma and Fannie Bartley. In this, the final Old Testament window, the open hand of God extends from a cloud blessing His people. 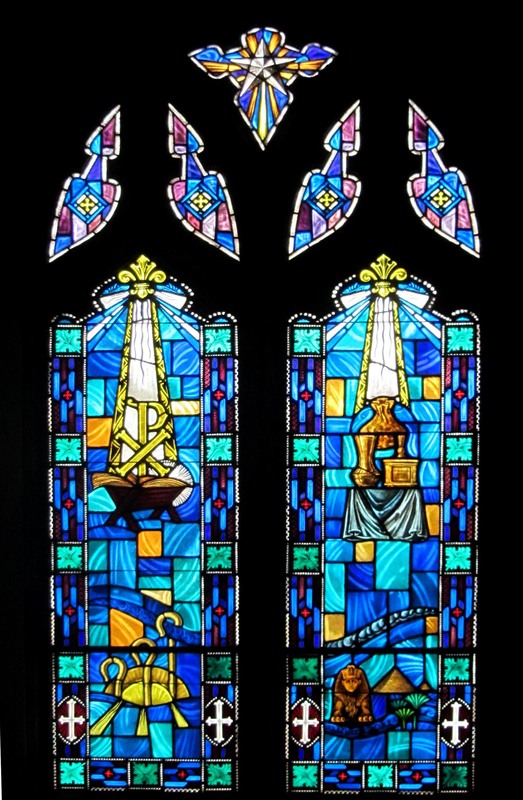 Symbols in this window reveal the power of God working through men. Here on the right are pillars of the great temple and an architect’s square. Below that is a seven-branched candelabrum. At the bottom on the left are a harp and a shofar. Above the intertwined shofar and harp is the figure of Job. The Fruits of the Old Testament Window is in memory of William Hamilton Moore and his wife, Lucile Fulton Moore. The east transept window records the awe and excitement of the Annunciation. Hovering above the principle figures are heavenly musicians and above all, the monogram of Mary, Mother of Jesus. In the central panel the angel Gabriel, clothed in golden glory, blesses the kneeling Mary, holding a lily and robed in the blue of the heavens and crowned with twelve stars. To the right is Joseph, staff in hand, which also bears a blooming lily, the rod coming from the stem of Jesse. The left panel holds a figure of John the Baptist. In the lower part of the two panels are Mary and Joseph bound for Bethlehem led by an angel and a wayfarer kneeling in prayer at an outside shrine. 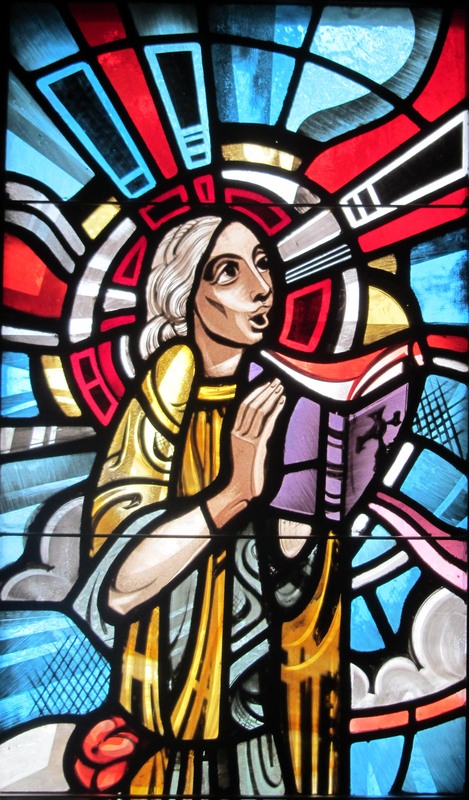 The New Creation Window is in memory of Mary Olive Barnhart. 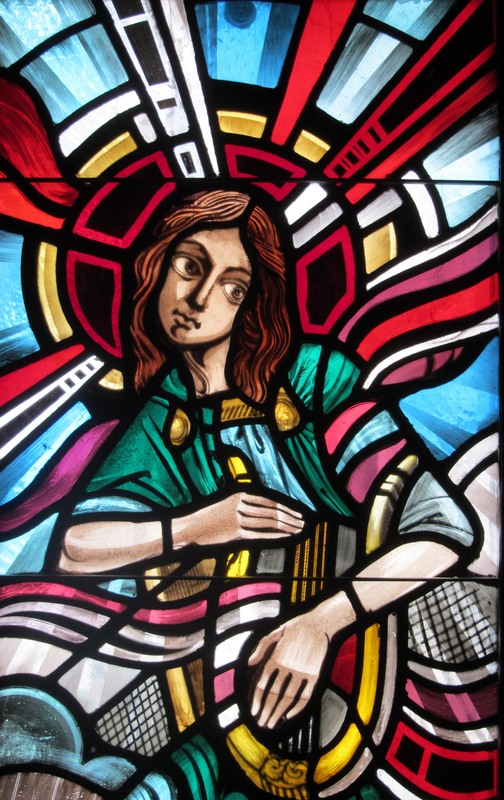 Closest to the front, on the east wall of the sanctuary, The Annunciation depicted in the east transept window becomes a living reality in the symbols of the Messiah window. Powerful in its simplicity, against deep shades of blue and green, is the crib and above it the Greek letters Chi Rho, the first letters of “Christ, the Messiah.” Below are shepherds’ crooks. On the right are rich gifts from the three kings. The Holy Family’s flight into Egypt is recalled by means of the ancient Egyptian sphinx. Shining above is the guiding star of the Epiphany. 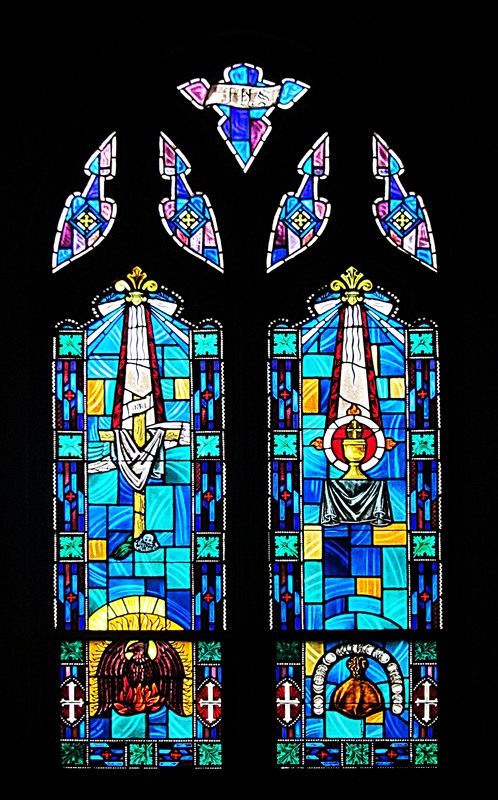 The Messiah Window is in memory of Henry S. Eastman and his wife, Mary H. Eastman. The middle window in the east wall of the sanctuary is dedicated to the Apostles. Th e three drops of blood above the open Bible suggest the willing suffering and sacrifice of Christ and his followers. A lamp of light and love illuminates the paths of all believers. Below is a storm-tossed ship flying the Christian banner. To the right, a scroll and flaming torch proclaim Jesus’ words to His Disciples, “Ye are the light of the world.” Beneath this is a red cross of service and concern. The symbol consists of tau crosses which link with one God commanded Moses to set up in the wilderness for the weary and rebellious Israelites to look upon. Bordering these panels are the names of the Apostles, with Matthias replacing Judas. High above is a bell calling all to worship God. The Apostles Window is in memory of George Adamson and his son, Paul. The next window brings us to the time-honored symbols of the four Evangelists. In Matthew a winged man is pictured, because Christ’s human descent is traced in Matthew’s Gospel. For Mark, the lion emphasizes the majesty of Christ as King. Luke is dramatically presented by the winged ox, an emblem of sacrifice. John is symbolized by a mighty eagle. Above the four symbols is the Dove of the Holy Spirit. 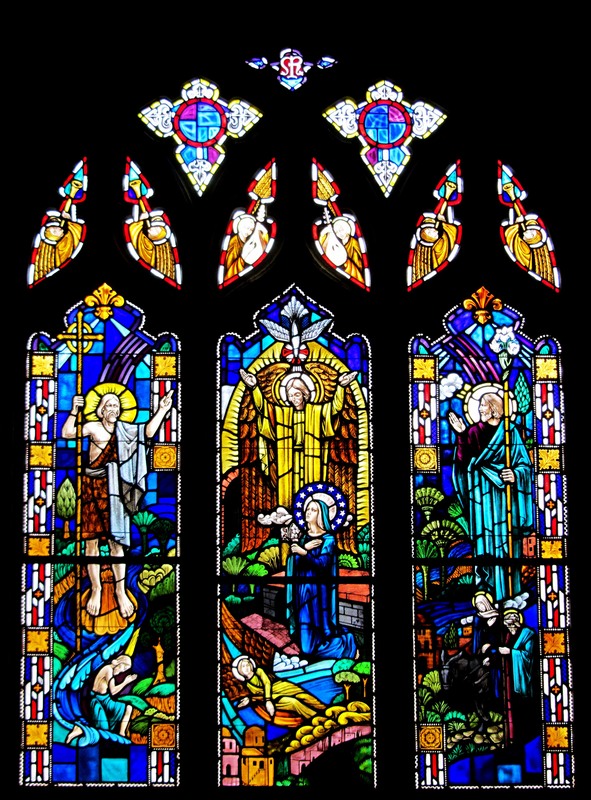 The Evangelists Window is in memory of Charles Dooley and Margaret Marshall. 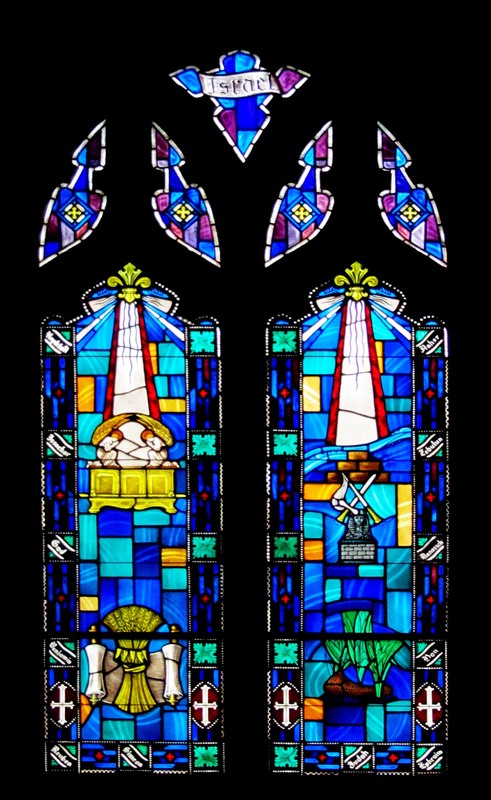 In the fourth sanctuary window, surmounted by the first three letters of the Greek word for Jesus – “Iota Eta Sigma” – are four powerful symbols of His last agonizing hours on earth. The chalice and the budded cross recall the Last Supper. Below, thirty pieces of silver portray Judas’ betrayal. The robe-draped Roman cross shows the Latin initials “Jesus of Nazareth, King of the Jews” and a skull. In a burst of flame, the phoenix, an ancient symbol of resurrection, brings hope and comfort and prepares the faithful for the glory of the resurrected Christ. The Crucifixion Window is in memory of Elizabeth Chick Geissler. In the great balcony window is the message of the resurrected Jesus—the Living Christ. The Father, with open hand emerging from the crown, is above. The Son, robed in blue and white, is seated on His purple throne. His nail-pierced feet are resting on the world. The Dove of The Holy Spirit, wings outspread, is in upward flight toward heaven. Below Christ is the Lamb of God standing on the still-closed Book of Seven Seals and holding the conquering banner of Christianity. To the right is St. Michael, weigher of souls. He too carries the Christian banner. He stands on the coiled serpent, reminiscent of the one lurking in the Garden of Eden in the Creation Window, indicative of the ever-present battle between Good and Evil. In the lower outer panel on the left is the kneeling figure of St. Peter carrying the keys of the kingdom of heaven. Opposite him is St. John, banished to the island of Patmos, the open book of Revelation in his hand. On the lowest level the chalice recalls the one which Jesus gave to his Disciples at the Last Supper. To the right, the basin and cloth commemorate Jesus’ act of humility and love in the washing of his disciples’ feet. Again the Alpha and Omega reflect the idea of Jesus as the beginning and the end. With the background of golden-robed angels playing their joyous music, the crimson-winged seraphim, and just a hint of a rainbow, one gets a hint of a new heaven and a new day. Two modern Kansas City scenes—city and country– bring us to the present and remind us that God is everywhere and always. The Resurrection Window is in memory of William James Campbell and his wife, Flora Prather Campbell. These windows were designed by Ronald Neill Dixon and fabricated by the Willett Glass Company. They were installed in 1974 when the Education wing was added in 1974.